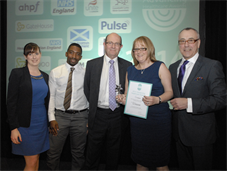 The team behind the Assistant Clinical Technologist Apprentice Scheme (ACTAS) have been recognised at the 2014 Advancing Healthcare Awards at a celebration lunch held at the Grand Connaught Rooms in Central London. The program won the ‘Inspiring the Workforce of the Future’ award, sponsored by NHS Employers, and introduces people from the local community with basic numeracy and literacy qualifications to the Trust’s workforce. Apprentices are trained to assist with the management, maintenance and use of medical equipment in a variety of clinical and technical environments, including Medical Engineering & Physics (MEP), renal technology, theatres and A&E. The skills that apprentices acquire on the scheme serve as a springboard to a career in a variety of healthcare science-related fields. Registered Science Technician awards are also available for successful students, meaning that the scheme has real professional worth, and the judges felt that the program as a whole was a great way of integrating people within the community. The scheme was pioneered in response to a trend that saw careers in healthcare science becoming increasingly restricted to graduates, meaning that a skills gap began to develop between experienced staff, who are now beginning to retire, and those in the early stages of their careers. King's open day 2013 was held on the 7th of July. MEP's stand showed off our wide range of work to visitors and our staff colleagues. Click one of the images below to open the gallery.